As SIP trunking becomes more reliable and trusted, companies are taking advantage of the ability to consolidate standard PSTN phone lines from multiple office locations into a single SIP trunk. Most of the larger SIP providers can provide phone numbers for multiple countries, allowing for even further consolidation of telephony resources. Skype for Business is very well suited to this sort of consolidation. Typically, larger companies deploy large centralized Enterprise Edition pools in a few central datacentres that serve offices spread across entire continents. These centralized pools in turn connect to a SIP trunk over a trusted, secure connection. As mentioned, these SIP trunks can provide phone numbers for multiple countries, and price those calls as if they originated from those countries. 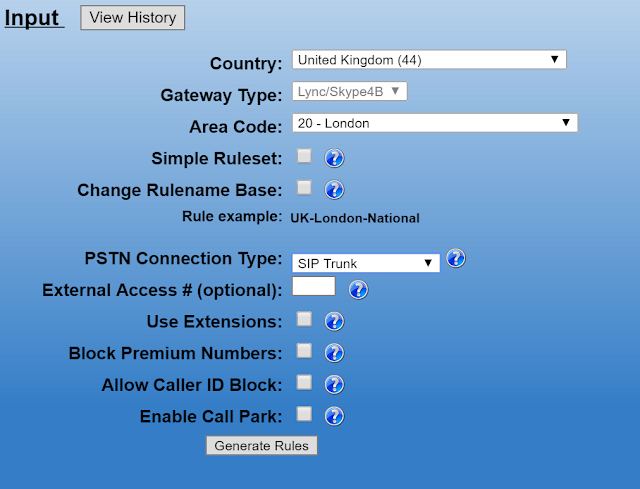 So, if a company has a SIP trunk in London, UK, they can give out phone numbers to other countries. For example, users could have Germany-based phone numbers served out of the London SIP trunk, and calls from those numbers would be priced as if they originated from Germany. 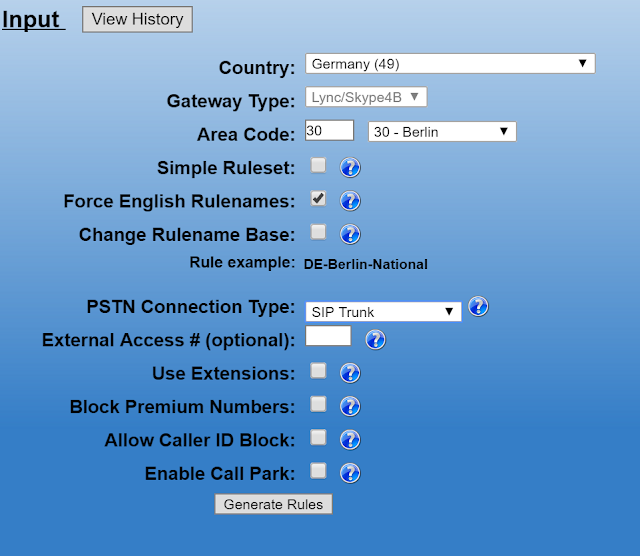 If a German user placed a call to another German phone number, they would be charged as a local or national call, even though the SIP trunk may physically reside outside of Germany. Conversely, if that same German user called a London phone number, the call would be charged as an international call. Setting up Skype for Business dial plans and voice policies in this situation can get tricky, but fortunately I've come up with a very clean and easy to execute plan on how this can be accomplished using the Lync (Skype) Dialing Rule Optimizer. All user phone numbers for all three locations are hosted out of the London SIP trunk. Let's assume this is a greenfield deployment, and nothing has been done yet in terms of Enterprise Voice configuration outside of getting the London SIP trunk connected to Skype for Business. The first thing to do is to generate rulesets for each of the three locations using the Dialing Rule Optimizer. Note that I selected the "Force English Rulenames", which I did just because I can't read German or French and would prefer English rule names and descriptions throughout my Skype for Business deployment. The resulting .PS1 rulesets are then copied to one of the Skype for Business servers. 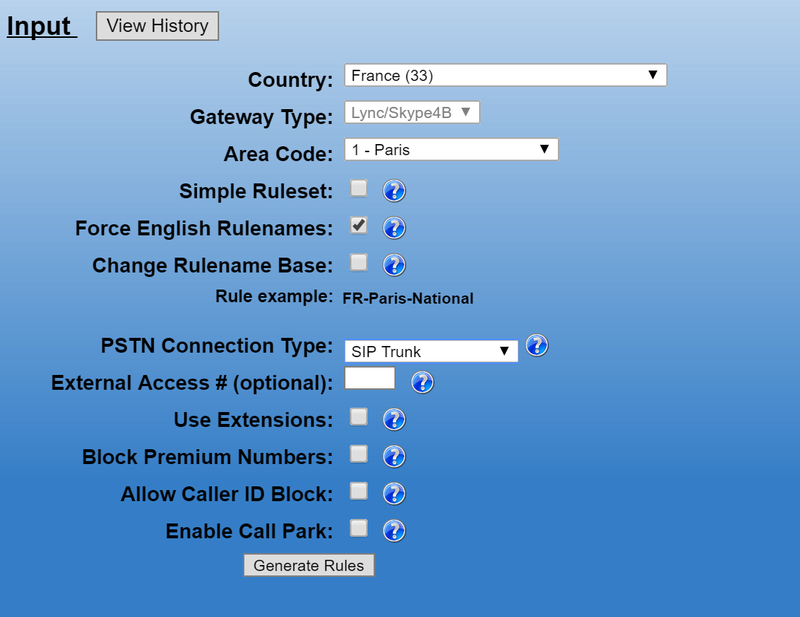 First, the London ruleset is applied to the deployment, creating user-level dial plans and voice policies when prompted. When complete, there will be a single London dial plan and 3 voice policies. All routes use the single SIP trunk (as you would expect, since its the only one available). In this state, we can easily assign a UK dial plan and voice policies to UK users as appropriate. Next, run the rulesets for Berlin and Paris. This is done for multiple reasons. Firstly, it will create German and French dial plans, so users in those countries can dial numbers as they do in those countries. Secondly, it will allow administrators to assign country-specific local, national and international policies. 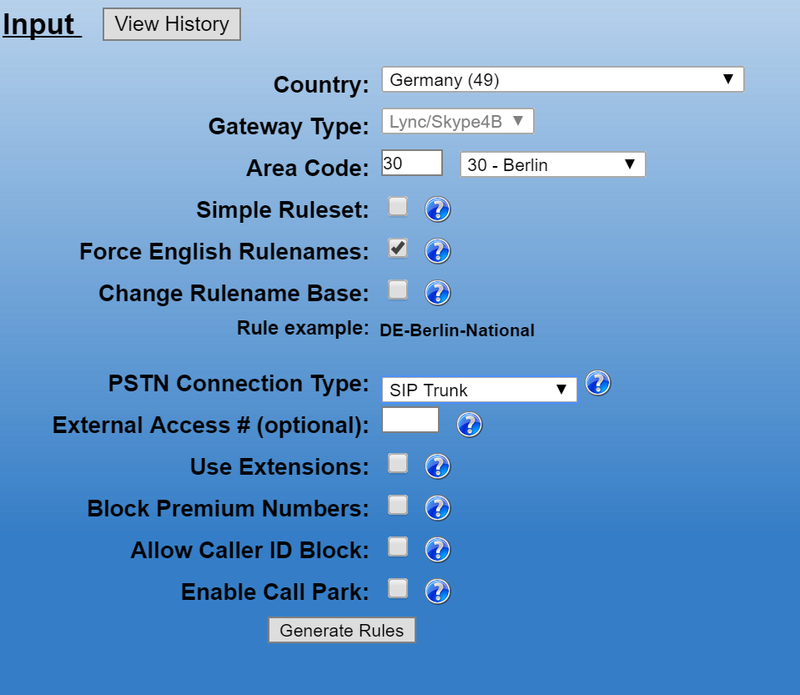 Someone assigned to a German national policy will only be able to dial phone numbers in Germany and nowhere else, regardless of the physical location of the SIP trunk. When running the rulesets, make sure NOT to select the option to use least-cost routing. Least-cost routing only works with multiple SIP trunks from different providers. 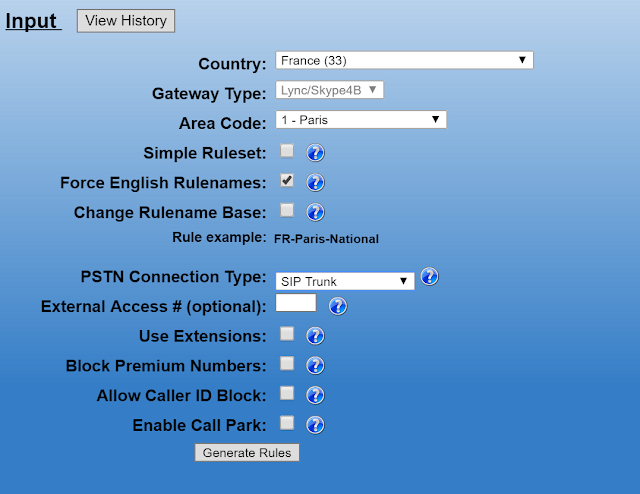 With a single SIP trunk, as in this example, implementing least-cost routing adds unnecessary PSTN usages to voice policies that ultimately don't accomplish anything. If we make a call from a German number to London using a London route, the call will still be billed as an international call from Germany, as the SIP provider will see the German number as the source and bill accordingly. Once done, the dial plans and voice policies will look as below. This might seem more complicated than absolutely necessary, and you would be right. You could certainly just use London-based rules for all locations, but it would limit your options severely. Setting up things in this way will allow users to dial numbers exactly as they do at home, and also allows administrators very granular control over dialing capabilities. Common area phones in Paris can be limited to local dialing in Paris. First level helpdesk employees in Germany can be limited to dialing only German numbers. This shows how easy it is to use the Dialing Rule Optimizer to quickly setup flexible dial plans and voice policies in even the largest voice deployments. If you have any questions about this method, please leave a comment.